Roy Keane is currently Ireland assistant boss. 16 YEARS ON, Roy Keane has revisited the infamous Saipan controversy that led to him missing out on playing at the 2002 World Cup for Ireland. The former Man United star and current Ireland number two was speaking alongside the Boys in Green’s manager, Martin O’Neill, as part of ITV’s World Cup podcast. Keane played with Ireland at the 1994 World Cup and had been expected to lead the team in 2002, before a heated row with boss Mick McCarthy led to him leaving the camp. McCarthy had been angry over a brutally honest newspaper interview Keane had given in which he complained about Ireland’s preparations for the competition. The pair traded insults in front of other members of the squad, with McCarthy at one point accusing the Corkonian of “faking” injury to avoid playing in a match. That accusation especially angered Keane, who says he has no regrets over his behaviour at the time. “I wouldn’t say I have any regrets. I was disappointed it happened, and the way it panned out. “There are obviously two sides to every story. There was a lot of talk when we got over there about the facilities — that was well documented. I was disappointed: no bibs, no balls, no cones, which really irritated me, because if it happened to Brazil or Germany or England at the time, there would have been uproar. “Strangely enough, that was all taken care of. Later on into the week, I think the night before we were leaving Saipan, there was a bit of a team meeting, I was confronted by the manager and I stood up and had to fight my corner. I would do it again tomorrow. 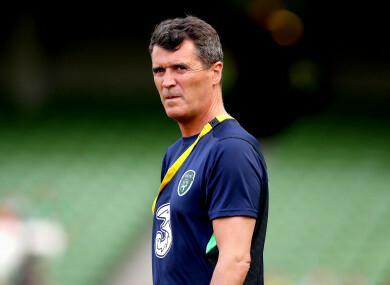 Keane played down the idea that his exit had anything to do with the perceived poor preparations and inept training facilities for the Irish team. “Far from it. That was all taken care of. That was sorted out one or two days before that. What really made me angry and disappointed is when you get accused of something by your manager in front of a group of players, you’re going to react and I reacted. As a senior player and captain, I just felt: ‘They are lies.’ I was basically accused of faking an injury and not being available for a match, when I was injured. It was a really strange time to bring it up and it wasn’t true. So if you make those kind of accusations against me, have a guess what is going to happen. One of the biggest problems of my career, like a lot of players — I’m no hero — I played far too many games when I was injured. “It’s alright me sitting here. If you spoke to Mick or some of the other staff, they might have a different side to it. I know it takes two to tango. But that’s what happened. “Once I left the hotel, the team left early the next morning, the damage was done. If an apology came my way and [they said] it was a mishap, things could have been different. But once I landed back in Ireland, the damage was done. I couldn’t go back into work with a manager who probably felt that about me. Yet strangely enough, nobody ever made these accusations against me when I was playing and we were winning matches and we were qualifying. So I found the timing really strange, particularly in front of the staff and the group of players. The bibs and balls and cones — that was all taken care of, that had settled down. By the end of the week, we were kind of laughing and joking about that anyway — as you do, you have to move on. Keane added that the fallout from the incident affected his family. “Mostly for my parents, it was a stressful time, without a shadow of a doubt. People say I ‘brought it on’ myself. I didn’t bring it on myself. This stuff was thrown at me, and yet they suffered for it. I could deal with it, because I’m thinking I knew what happened. Email “'I'd love to have played in another World Cup... But I don't regret any of my actions'”. Feedback on “'I'd love to have played in another World Cup... But I don't regret any of my actions'”.